In the Spring of 2014, I attended my first aikido seminar. The seminar was hosted by Aikido of Pittsburgh and featured Ellis Amdur who would be teaching his unique framework for aikido which he called Taikyoku Aikido. Taikyoku Aikido is based on Amdur’s observation that all aikido techniques can be mapped along five movement shapes, force vectors, or ‘themes of movement.’ These themes conform rather closely to aikido’s ‘numbered’ techniques — ikkyo, nikyo, sankyo, yonkyo, and gokyo — and can be performed as a solo movement practice or within the context of more conventional aikido practice, whether in waza or randori. As a movement theme, ikkyo becomes ikkyoku or movement patterns on a vertical plane: rising and falling. Nikyo becomes nikyoku, movements along a horizontal plane: side to side in a figure-8 pattern. Sankyoku are movements that spiral up and away from the body. Yonkyoku spirals down and toward the body. Gokyoku concentrates force to a single point, like a wedge. Another way of looking at these themes of movement is that they are planes one ‘finds oneself on’ during freestyle practice, with the natural and logical movement ‘presenting itself’ to tori. If thought of as positions on a clock face, ikkyoku is performed when one’s arms are at the one o’clock position, nikyoku at two, sankyoku at three, and yonkyoku at four o’clock, with gokyoku being applicable along at any position by cutting through resistance to a concentrated point of uke’s body. This framework, first presented to me by Budd Yuhasz a few months prior, revolutionized the way that I thought about the aiki-arts. I had always struggled with the idea of the aiki-arts being a ‘natural’ expression of universal physical principles because the way I was taught (originally in traditional Korean hapkido) was very ‘defensive’ and reactionary, meaning the attacker does some attack and I, the person practicing, responded with a specific pre-planned technique. The problem with this type of training was that there were simply too many techniques to choose from and, when presented with real, live resistance, like I experienced in Brazilian jiu-jitsu (BJJ), I was slow, almost paralyzed by having too many options and, by the time I picked which weapon in my vast arsenal to use, it was too late and I was already dying or dead. Amdur’s Taikyoku framework simplified things into five options, five shapes, each one being the most logical movement based on the physical geometry between both practitioners. Since each movement theme had a specific context within which it was most useful, there is only one ‘natural’ choice for how to respond and this makes the response faster and more ‘true,’ so that it is no longer a defensive reaction, but is the physical will of the practitioner and his or her body exerted along the most desirable pathway so that the technique becomes manifest on its own and is no longer slowed by cognition. If the will is always towards irimi (even when retreating or turning), and the body knows which shape to make next, based on where it finds itself, not reliant upon the body of uke, aikido (aikijujutsu or aiki-kempo) is what is happening not what I am trying to do to you. This is takemusu aiki, the natural and spontaneous expression of aiki. I was hooked. Along with this revelatory martial experience, this seminar also shifted my life for the better in another way because it was the first gathering of who would become the principals of the Taikyoku Mind & Body collective, for this is where Budd Yuhasz, Jevin Orcutt, and myself all shared the mats together for the first time with Ellis Amdur sensei. Budd and Jevin had been training brothers for years under Amdur’s guidance, but I had only just met Budd a few months prior. At Aikido of Pittsburgh, I met Jevin and we were all together for the fist time, an experience that laid the foundation for a lasting brotherhood and the martial collective we would eventually form. Taikyoku Aikido became Taikyoku Budo through Budd Yuhasz’s realization that Amdur’s principles, while being an ideal container for a personal internal strength practice (qigong), were also applicable in striking, grappling, and even weapons, whether within, or even transcending, any style or system. Through our connection, mutual interest, and sharing of ideas, Taikyoku Budo eventually became one aspect of the Taikyoku Mind & Body organization founded by Budd, Jevin, and myself. 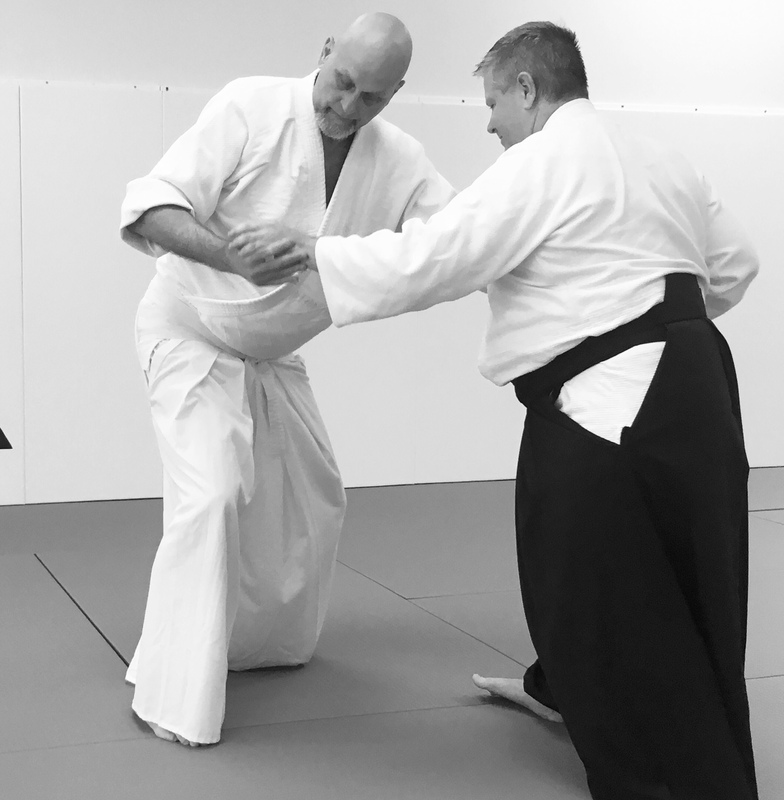 Here we are in 2019 and Aikido of Pittsburgh is hosting Ellis Amdur again this coming weekend for a three-day seminar, with Budd Yuhasz co-teaching an internal strength class on the third day. Since that seminar in 2014 a lot has changed, but some things remain constant. The Taikyoku weapon practice that Amdur has been working on with aikido and BJJ black belt Bruce Bookman has developed further to include both bokken (sword) and jo (staff) techniques. Amdur has also begun teaching ‘modules’ of Araki-ryu kata to a few different schools across the country, calling what he is showing Taikyoku Araki-ryu. Budd has continued to refine his internal strength practice to impressive results. Jevin has expanded his training beyond Taikyoku Budo to include both BJJ and Ono-ha Itto-ryu Sokaku Den, the sword style Takeda Sokaku is said to have practiced before developing Daito-ryu aikijujutsu. Along with my friend Dwayne Bowie and my brother, I opened my own dojo in Severna Park, MD called Kogen Dojo, a name inspired by Amdur sensei, where I teach both Taikyoku Budo and BJJ. This weekend’s seminar at Aikido of Pittsburgh will focus on Taikyoku Araki-ryu on Friday, Taikyoku aiki and weapons on Saturday, and internal strength for the aiki arts on Sunday, something Amdur has written about at length in his book Hidden in Plain Sight: Esoteric Power Training Within Japanese Martial Traditions. I am sure that the seminar will be amazing and is not to be missed.